Map tour of the largest individuals sampled since 2002, 52 of our most extreme fishes have made the map. Largest individuals sampled since 2007, 70 of our most extreme fishes have made the map. If you have any additional questions and/or data requests please submit the Multispecies Fisheries Research Data Access Request Form and we will contact you as soon as possible. 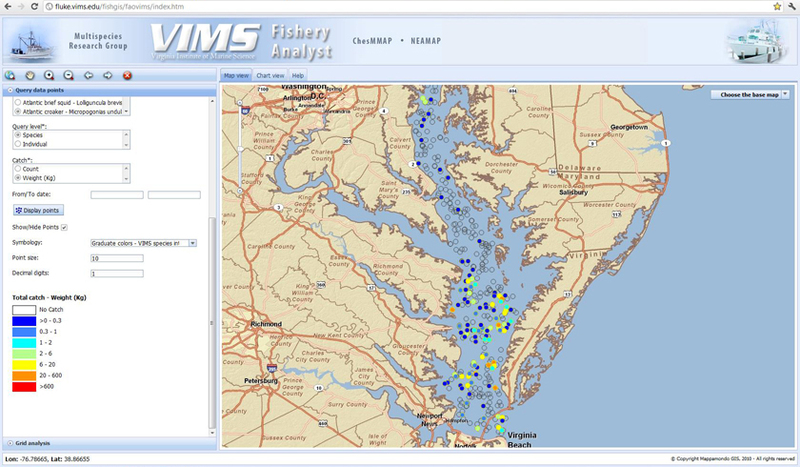 Fishery Analyst Online is a web GIS application that will query the multispecies research groups fisheries data. Data will be searched and selected using a rich query interface based on criteria such as survey, cruise, species caught, and catch characteristics. Our fish stomach diet analysis database contains over 115,000 individual stomach samples and is growing. The database offers the opportunity to choose to retrieve fish food habits analyses by survey, year, age, and state summarized by either prey weight or prey number.